I don’t know if I can fully explain or put into words the pull that music has always had for me—but it looks like I’m going to give it a damn good try. It’s a connection that is almost otherworldly. As a devout, practicing atheist, I think that my religion is worshipping at the temple of all the creative arts, with particular enthusiasms for film, art, design, and the written word. Yet for me, music remains the most holy. I’ve had a passion for and connection to music as far back as I can recall. I was born in the early ‘60s and had music-obsessed elder siblings who, thankfully, were into the best stuff of the era. The sounds of The Beatles, The Rolling Stones, The Who, & The Kinks fuse with all my early memories. This constant exposure to music inside a house with an ever-growing record collection obviously fuelled this passion. And it did not go unnoticed from my sometimes puzzled parents. They love to tell the story of how, at a time before I was able to read, they would ask me to go and fetch a specific single from their collection and I would unfailingly bring them the right record, even with a few 45s having similar labels. Regardless, an ongoing interest, love, and engagement for something isn’t sustained in a life-long capacity simply because of trigger from childhood. My passions are ultimately my own. I do, however, credit that early exposure to music as having a significant, continuing affect in two ways. First, while it was predominantly then-contemporary ‘60s rock and pop that was played in the home, it wasn’t always necessarily the same stuff that was also on the radio (not that the commercial radio of that period is anything to sniff at). That knowledge of there being “alternatives”—combined with my natural curiosity and ever-evolving multi-genre tastes—let me know from an early age that there was lots out there that wasn’t part of mass pop culture. As a result, a significant chunk of what I’ve listened to through the years has often existed outside of the North American mainstream—but not always. While I am certainly opinionated, as tuneheads tend to be, I have never “gotten” the whole “I resent the success of [fill in the blank] who I used to blather on about endlessly when they were my own little personal obsession and now brand them as passé” attitude harboured by so many alternafolk that I’ve known through the years. In fact, I love seeing artists I like do well. Musicians need to make a living too, and it’s not easy to pull off (and besides, there is also the selfish aspect that I like being out and around and hearing what I like rather than what I don’t). Second (and this is a big generalization, I know, but) I’ve found that a lot of people have experienced music within the framework of their life thusly: they are largely oblivious to most of it until their teens, then they discover the thing du jour, it becomes “their” music, interwoven with those key transitioning teenage years, and then at some point in their 20s, everything new is “crap,” just as almost everything preceding them is “before my time” and of little-to-no interest. That was not my trajectory at all. I see the different music eras as part of an ongoing continuum, with one not necessarily better or worse than the other, but rather each having something unique. I have found that because music has played a role in my life from a young age—combined with being exposed to both the newest sounds as well as having, for whatever reason, an equal interest in what came before me—my relationship and how I experienced music is a little different than it has with been for most people I have known. My tastes tend to be all over the map, sometimes delightfully contradictory, with conflicting reference points. I have also tended to confuse many of my peers in that I have both memories of and interests in music that often pre-dates them while my ongoing, contemporary engagement to what’s happening and coming out now baffles (some of) them. With My Life – In Concert!, I will be focussing on one of my biggest passions-within-a-passion: going to see live music performances. I saw my first concert in 1975 at age 12 and still attend all sorts of shows to this day. There is something magical, alchemical to the whole process of performance and creation. When that is twinned with the right audience, the exchange of energies between performer and audience can produce an in-the-moment, unrepeatable transcendence. It might sound corny or pretentious, but it’s true. Then there are the related aspects such as the whole ritual of getting ready for a show, travelling there, waiting for things to get rolling, etc. The anticipation that builds throughout the day. It’s all part of the experience. Throughout the years, I have kept and collected a significant portion of my concert tickets. In emulation of someone else’s great idea from many years ago, I finally got around to taking them and turning them into a large collage that now hangs in our kitchen. This first collage was completed a few years ago and there is now a second one joining it, one wall over. Of course, it is an ongoing piece of work, in tandem with my life. Concert Ticket Collage 2: 2008-2013 (so far) also featuring reproductions of lost tickets from gigs from 1975, 1982, & 1985. They are often a point of interest for people who visit our home, sparking conversations about shows that they or I have attended. I too will scan the collages sometimes when in the kitchen, while waiting for the toast to pop up, tweaking all manner of memories in the process, not just of the performances but also of the people I experienced the shows with and what was happening in my life at any particular time. Thus, my collection of concert tickets chronicles one key stream of my personal story. I also appreciate the tickets as ephemera and historical objects, noting how they have changed in size, appearance, and, notably, price while also sometimes marking destinations and performers that no longer exist. What I will be doing with this ongoing memoir is revisiting each of the tickets in sequence, recalling not only the gig but also its larger surrounding—preceding events, incidents of note or humour, things that were seen and heard—and reflecting on the concert in the context of my life at a given time. Additionally, I will discuss my past interest in a particular artist and music-related topics. Finally, I will include a scan of the available tickets along with pertinent online pics, videos, information, and artefacts. Unsurprisingly, I do not have a complete collection of tickets representing every show I have seen. For starters, I attended large numbers of gigs from local and regional bands throughout the years, particularly between 1979-1992, in clubs and bars where there were no tickets changing hands. In other cases, tickets have simply gone missing. Since my focus here is on stand-alone concerts and festivals as well as key bar or club gigs of note, I am going to be looking at around 40 additional shows where I no longer have the original ticket. All told, as of May 2010, I am probably going to be writing about 150 or so live performances from the past, encompassing everything from sets in sparsely attended small clubs through to a filled-to-capacity Skydome for Paul McCartney. Concurrently, I will be writing reviews of new shows as I attend them in the present day. I should probably also note that I am a product of the underground ‘70s and ‘80s, from a decidedly arty-party background. This means that while most of my friends and acquaintances were and are interesting, intelligent folks—many of them involved in some area relating to creative aspects or mediums—our times together going to gigs could sometimes mean spells of good ol’ fashioned ne’er-do-well highjinks and excess (it was the era of try everything—twice … and I often did!). So, for the more delicate among you, keep those smelling salts close at hand, particularly once the ‘80s really get rolling! That being considered—and because I want to try and evoke a snapshot of each evening and era including personal biography—I will be writing this blog under a nom de plume. I hope you’ll join me in reading about Various Artists! Love, love, love your topic! 1978 was the year of reckoning for me too, and I have been blazing paths to concerts ever since. 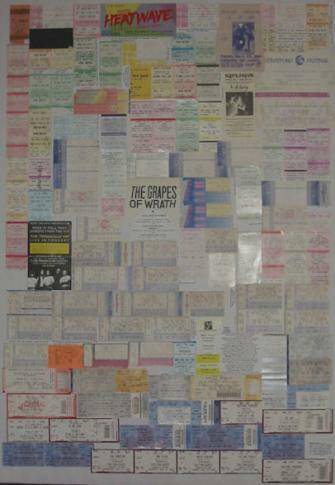 I,too,have all the tickets displayed on a huge bulletin board in the room that used to be my son’s bedroom which I converted to a music room when he’d relocated for college and life beyond. It’s a highly visited spot everytime friends and family come around. I also have a wall covered floor to ceiling in album covers–you know, those works of art we all used to pour over before the birth of cds and tiny liner notes? Deciding which albums were “wall worthy” led to big discussions between hubby & me. Time on the treadmill finds me lost staring at the album art and the tickets and remembering each joyfilled moment spent with my favorites on stage. lschmoopie — Glad you enjoyed, and that’s great that you too collect and showcase your ticket stubs at home. That’s also very cool re: the album covers as well. What constitutes “wall worthy” in your home? A good friend of mine, who within a few entries will be appearing consistently in these blog entries of mine, did the album cover thing on the entry wall to her apartment in the ’90s, although her selections were more from a “bizarre retro cover art” perspective rather than personal faves, per se. I love the idea for your blog. Most of the live concerts I’ve seen I happen to have all ticket stubs for; except the ones for which I was on a list and didn’t require a ticket. During my college years I worked as a D.J. for the campus radio station in NYC, on a wimpering frequency that spanned a five block radius—but this allowed me to get on the list for some good shows that I did wish I had stubs for. If anything, to help me keep the dates straight. I’m looking forward to reading more of your entries, especially because we certainly appreciate similar sensibilities. Live shows are the oxygen of musical communication. Unbeatable. Well, thanks! And I too was a college station DJ from 1984-1992 plus I wrote a bi-weekly music column in the local indie paper for several years — both were great for freebees, which sometimes meant no ticket. They were both also great for interviews, a number of which I will later be transcribing portions of in tandem with write-ups for corresponding shows. And, yep, the info on the tickets provide invaluable confirmations in terms of being able to keep dates straight, venue, and a variety of other details. Having the Net for fact checking purposes is also a godsend. P.S. “Live shows are the oxygen of musical communication” — well put. One year later and this still rings loud and clear. Love ya, VA! Happy anniversary! Love ya too, lschmoopie! Glad you revisited. This entry was posted in Canada, Classic Rock, Concerts, Glam Rock, Memoir, Music, New Wave, Punk Rock, R&B, Uncategorized and tagged 000.Ticket To Ride: An Introduction, Canada, gigs, live shows, music, My Life -- In Concert!, tickets, variousartists on December 1, 2010 by VariousArtists. 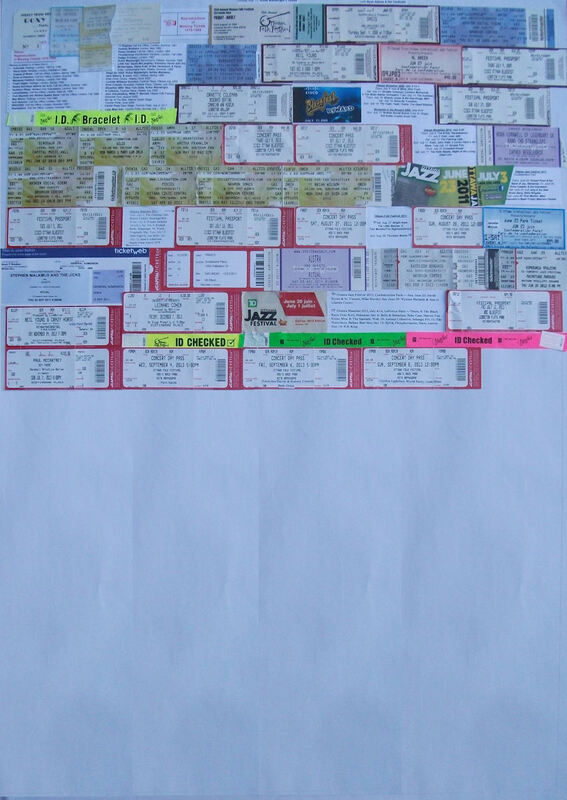 I too, have kept all my concert tickets and have a collage similar to yours – where did you get the idea??? I’ve been to many of the same shows!